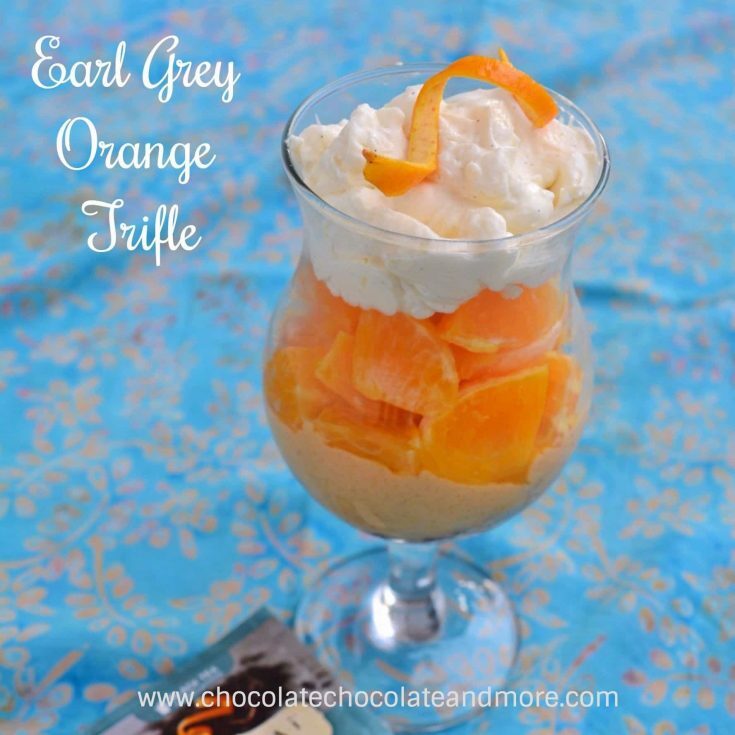 Earl Grey Orange Trifle - Chocolate Chocolate and More! 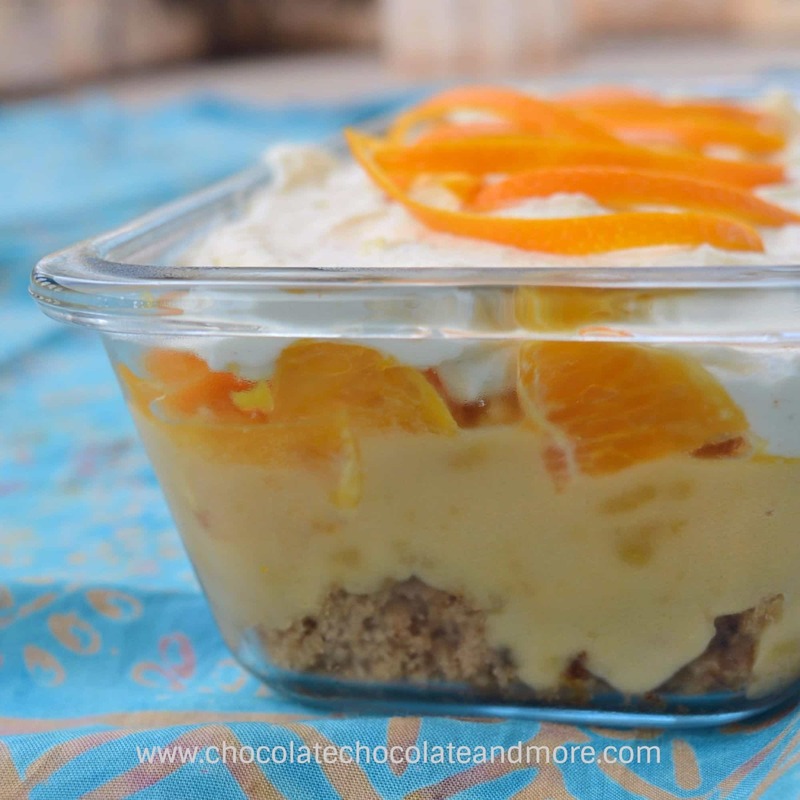 Layers of Earl Grey cake flavored with orange, Earl Grey custard, oranges and whipped cream make Earl Grey Orange Trifle unforgettable. This trifle starts with box mixes so it goes together quickly. Life has been really busy lately. As study abroad ended, I was diagnosed with severe anemia. Cambodia’s healthcare system isn’t fabulous so the insurance company sent me to Thailand for treatment. Right before I left, I moved my things into my apartment but had no time to unpack. Two weeks abroad for health issues put me way behind here so now it’s catch up time. The nice folks at Numi Tea sent me some wonderful teas. Those of you who know me, know I don’t drink coffee but I love a nice cup of tea. Most Cambodians drink coffee and weak green tea so finding decent tea here is not as easy as you might think. This post actually started as an Earl Grey cake. Just as I was going to put the cake in the oven, the outlet the oven was plugged into fried. It took about 4 hours to get an electrician to my place so I put the batter in the refrigerator. By the time the oven was ready to go again, I was suspicious that the cake would rise so I added a little baking powder and poured the batter into a new pan. Even though I greased the non-stick pan, the cake stuck and it was more domed than I like. 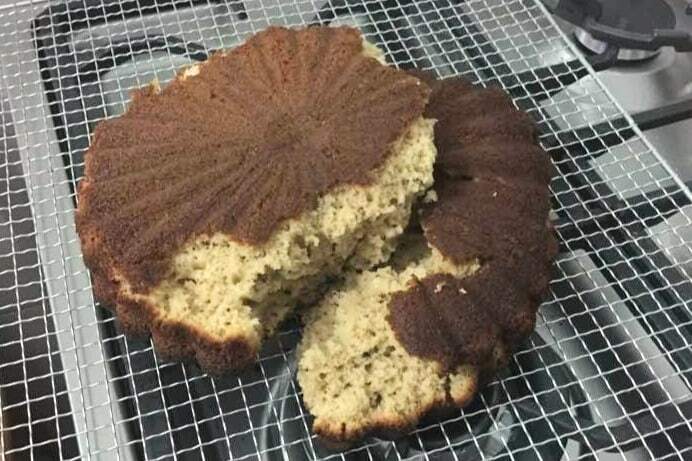 What to do with a ruined cake? Jenni Field from Jenni Field’s Pastry Chef Online suggested I make a trifle and she also suggested adding a little orange to it. Earl Grey Orange Trifle was born. Because Earl Grey has a mild flavor, it’s hard to get that flavor to come through in baked goods. A chef told me he puts Earl Grey tea leaves in some of his desserts to get the flavor to come through. So I opened up one of the Numi Earl Grey teabags and added the contents to white cake mix. I also substituted strong brewed tea (at room temperature) for the water in the cake mix. To flavor the instant pudding, I put two tea bags in scalding milk and let it seep as the milk cooled. Numi Teas are full flavored so if you use a different brand, you may need more tea bags to get the same level of flavor. I love that they’re fair trade too. Great tea and it’s ethical – what’s not to like? All that was left was to put everything together. Traditionally, trifle is served in a footed glass bowl so you can see the layers. I don’t have one of those so I put individual servings in wine glasses and layered the rest in two loaf pans. 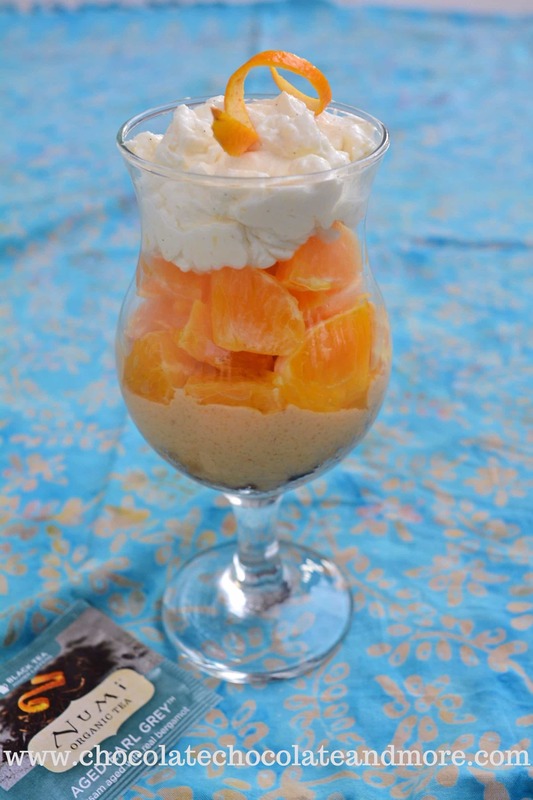 You’ll love the flavor combinations in this unique Earl Grey Orange trifle. 1 Numi Earl Grey tea bag. Put cake mix in a bowl. Open the tea bag and pour tea leaves into the cake mix. Add the liquid ingredients (tea, eggs and oil) and beat on medium speed for 2 minutes. Bake according to package directions. Let cool. Heat milk to scalding. Remove from heat and add tea bags. Cool to room temperature. Refrigerate until cold. Remove tea bags and use milk tea to make the pudding. Put ingredients in a mixing bowl and stir together to dissolve sugar and gelatin. Put beaters and bowl in freezer to thoroughly chill before mixing. You can make individual servings in wine glasses, ramekins, or small bowls or one large dessert in a trifle dish. This has four layers so you want to put about even layers of each ingredient in your serving container(s). Crumble cake in the bottom of your serving dish. Drizzle Grand Marnier or orange juice over top of cake. For individual servings, I used 1/2 tablespoon per wine glass. Spoon Earl Grey custard on top of cake. Cover custard with fresh cut oranges. Top with whipped cream and garnish with candied orange peel if desired.